It's time for a new monthly challenge at Sweet Pea Stamp's One Sweet Challenge. It’s perfect to get you in the mood for spring. This month’s challenge and theme are “Ringing in Spring.” This might help take away some of the blues for the places that are still getting snow. For my project I decided to use the rubber stamp Rose Fairy 2. 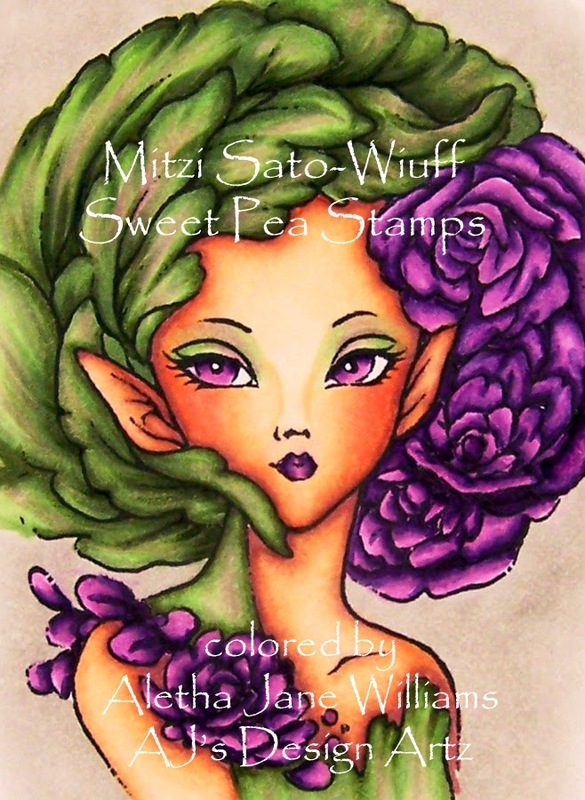 This beautiful stamp was designed by Mitzi Sato-Wuiff for Sweet Pea Stamps. I hope that it speaks the colors of spring. I do want to apologize for my purples not matching. In “real life” all purples are perfect. This is my camera’s fault! 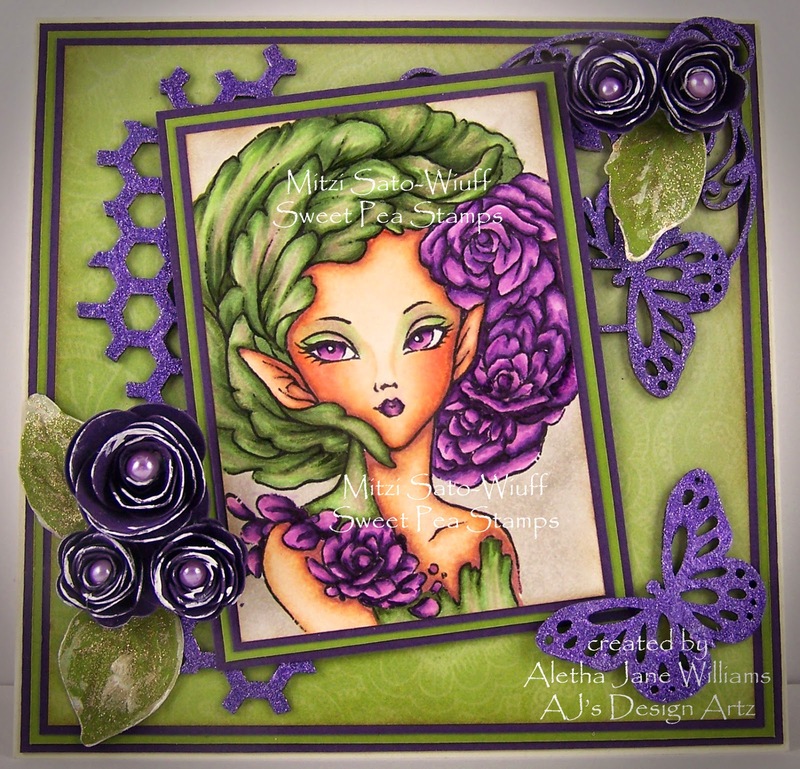 I have colored Rose Fairy with Copics, trimmed, then layered with Stampin’ Up!’s Elegant Eggplant and Old Olive cardstocks. I did get adventurous with this little piece of art. My designer paper is from my stash, I think it might be Kaiser Craft. 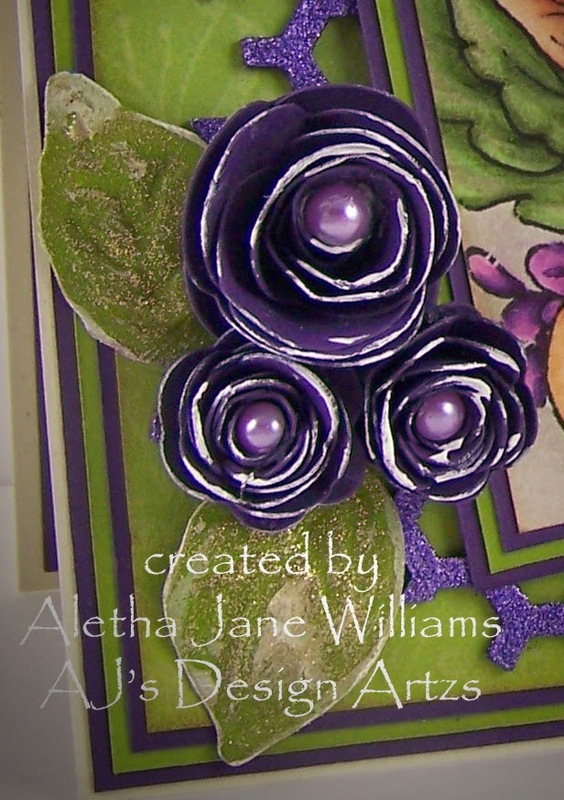 I decided to use a Sizzix die, 3-D flowers, to make my own roses. I got the inspiration from one of my Sweet Pea teammates, Milo. She has just the right touch with all of her embellishments and her “shabby chic” style. After rolling the roses, I added some DecoArt Gesso to the edges. They still needed some help so I added some flat-backed pearls to the centers. I also seem to collect a lot of laser cut shaped chipboard that I plan on using in some mixed-media work. My Eureka moment was “Why not use them on cards.” These pieces are from Blue Fern and FabScraps from Amazon.com. Before gluing down the pieces I added some Viva Décor Violet 3-D Stamp Paint. I do like how everything turned out. Rose Fairy 2 art card is available for purchase in my Zibbet store. I hope that you join us for Sweet Pea’s One Sweet Challenge. If you use a Sweet Pea Stamps image, you will receive a $10 gift card to the online store. If you win, and you do not use a Sweet Pea image, you will receive a $5 gift card to the store. 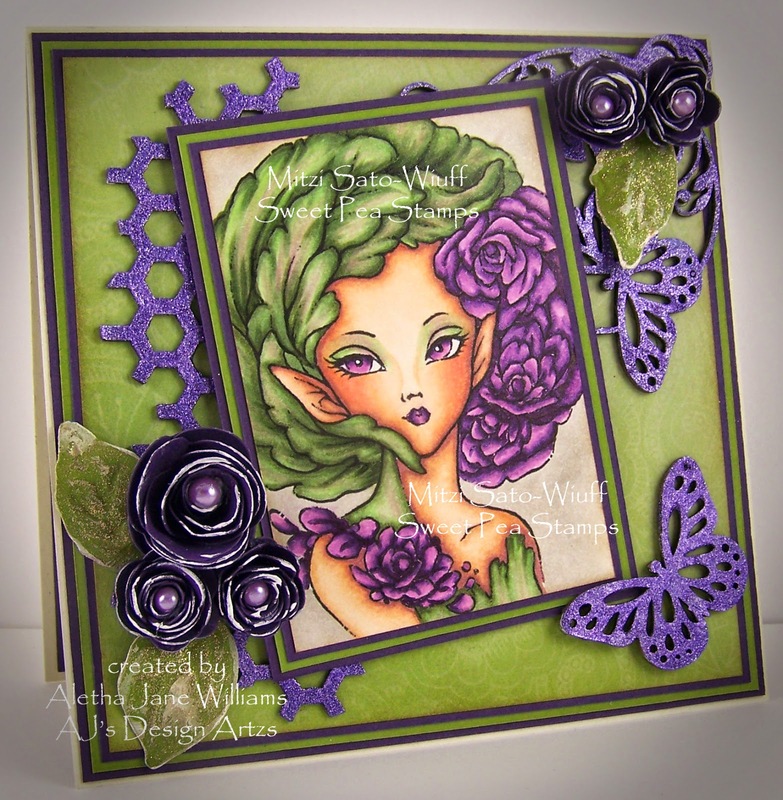 Why wouldn’t you use a Sweet Pea digital image or rubber stamp? I would like to invite you to join us at our Sweet Pea Stamps Facebook group. We have a weekly contest for your chance to win more beautiful Sweet Pea images. Come “like” our page so you can receive all the updates on Sweet Pea happenings.